I have been craving lighter foods lately, especially pineapple! I’ve also been feeling rather lazy in the kitchen, not the best thing for a food blogger. Luckily, this raw vegan pineapple mango sorbet solves both problems! Pineapple mango sorbet is the perfect simple treat for when you’re feeling overloaded in kitchen. It’s light, refreshing, and takes only 5 minutes to make! With just three ingredients and five minutes to spare, you can easily whip up the most delicious snack ever! Frozen pineapple and mango blended with a bit of young coconut water tastes incredible. It’s like sunshine on a spoon. After a long winter, (Who am I kidding, I live in LA!) I am finally ready to things to warm up. As the 60 degree days shift towards the 70s, I find myself wanting to eat lighter, healthier, and more raw foods. Today is actually my first of a 10 day high raw stretch! Since I ate five slices of the BEST chocolate cake I have EVER had yesterday, (find the recipe on my friend Josie’s blog, Sugar and Satire) today is the perfect day to kick things off on a lighter note. 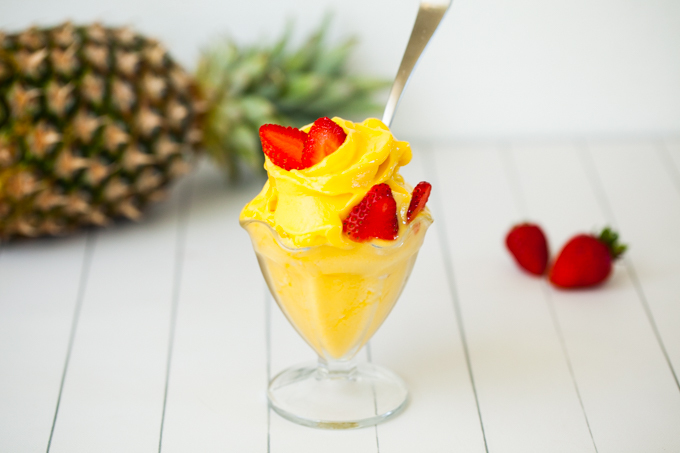 If you love raw foods and try this pineapple mango sorbet, be sure to rate it in the comments and tag a photo with #carrotsandflowers on Instagram! For other delicious raw vegan recipes, check out our Raw Vegan Walnut Tacos and our Creamy Raw Vegan Tzatziki! Creamy, light and refreshing Raw Vegan Pineapple Mango sorbet. Only 3 ingredients! In a high powered blender, blend all ingredients until smooth. Serve immediately as soft serve or freeze for 2-3 hours for scoop-able sorbet. I LOVE these photos! So crisp, white and refreshing. That sorbet looks so yummy, almost like a Dole Whip I bet! Yum!